If you were at the Bespoked Bristol show you probably came across Loopwheels there. When we hear the phrase 'suspension wheel design' we get a cold shiver as we remember all those heavy double rims with an elastomer sandwich that were doing the rounds 10 years ago. But this is an elegant solution, that works. And it's looking for funding. Loopwheels are the brainchild of Sam Pearce of Jelly Products, a Nottinghamshire-based design company. He's spent four years refining the design and now he's ready to go into small-scale production, with a Kickstarter campaign prviding the seed funding for the first batch. Sam explains: “I first had the idea of a wheel with suspension inside it when I was sitting at an airport waiting for a flight. I saw a mother pushing her child in a buggy. The front wheel hit a slight kerb and the child jolted forward because of the impact. It happened several times in the hour I was there and that’s what sparked my idea for better suspension, within the wheel itself. The Loopwheel is a rim suspended on three carbon leaf springs that loop out from the hub to the rim, and back again. Loopwheels have worked with a company that's better known for producing archery equipment to develop the springs, which are attached to existing hubs via a triangular strut. 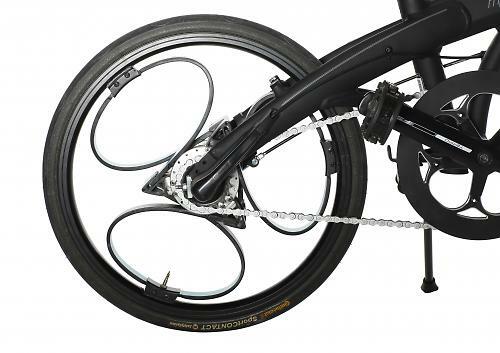 Obviously the rim can move, so rim brakes are out; Loopwheels use an internal drum brake. So what's the benefit, and why 20" wheels? Well, the benefit is a much smoother ride, and the tangential way the compliance in the rim works (moving directly away from the point of impact, wherever it is) means that the wheels cope with bumps and kerbs really well, especially in a smaller wheel. 20" wheels are predominantly a folding bike format, and suspension systems tend to add weight and complexity to folding bikes meaning they're not widely used. Loopwheels are much easier to spec, and they're retro-fittable to your old bike too, assuming you have enough clearance (50mm is needed) to allow for the movement of the rim. Sound like something you need in your life? Well, time to head off to Kickstarter and make your pledge. At time of writing the total raised is just over £14,000 of the £40,000 total, so a third of the way there. You can get a single wheel for £230, and if you want a full set then there's still one of the eight early-bird sets left at £420, after which there's 25 sets available at £490. For £950 you can have a full bike, the wheels built into a Dahon folding frame.